OverviewDisgaea: Afternoon of Darkness is a port of the PS2 game Disgaea: Hour of Darkness. 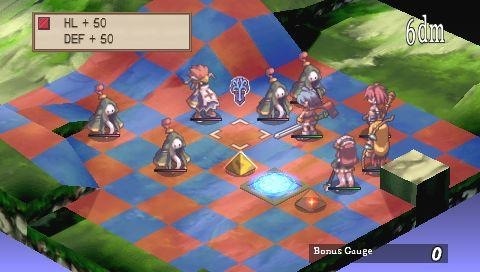 Disgaea: Afternoon of Darkness is a turn based strategy RPG. You fight as son of Overlord to get to the throne and in the way you meet new friends (and enemies) that make a fantastic story. Game is divided by chapters and every chapter has it's own story that will keep you wanting to play the game. Disgaea: Afternoon of Darkness is a port of the PS2 game Disgaea: Hour of Darkness for the PSP. D:AoD is a turn-based tactical RPG, wherein you move your allies around like pieces on a chessboard. You play as Laharl, the son of the Overlord (a.k.a. the king of the Underworld) and heir to the infernal throne, on your way to becoming the new Overlord two years after your father's pathetic death at the hands of a snack food. Along the way you meet several characters essential to your continued progression, such as: Etna, a flat-chested succubus/devil/pedobait and your loyal(?) vassal; Flonne, an Angel Trainee sent to the Underworld to assassinate your father two years after his death (better late than never), and Vyers, a mid-boss. Battle plays out on a chessboard-like terrain, where you can send up to 10 allies out to do battle and display their various skills. Height, positioning, and distance between you and the enemy are important factors to consider in battle, as they will make or break your strategies. Certain squares on the playing field may also contain special effects, which may prove either beneficial or harmful to your characters. Said spaces gain their effects from special pieces called Geo Symbols, which can be moved or destroyed as deemed neccessary. Allies are not limited to only characters you meet along the way, however, as you can make new allies in various classes such as Fighters (martial artists who specialize in fist weapons), Clerics (practitioners of the healing arts), and Warriors (masters of sword and axe). When you expend Mana (points racked up as rewards for kills (EXP is different, as it is used strictly for character progression, whereas Mana is more of a currency used for various purposes)) to create a new ally, the created character becomes your "student", which allows you to learn spells that they have available (the same is not true of skills, which are character-specific and are often attributed to specific weapon types). Each ally you create has differing weapon proficiencies, based on their class (monster-types are the only exception, as they can only equip monster-type weapons). This means they learn skills faster from certain types of weapons, and slower with others. This doesn't mean you have to stick to your ally's preferred weapon type, so you can have a spear-waving Fighter, or a Cleric wielding a sword. The game is chock-full of tutorials, so if you don't understand everything from my description, fear not! Everything is explained in an easy-to-understand format, and you can re-access the tutorials at any time if you need a refresher! Now you can add videos, screenshots, or other images (cover scans, disc scans, etc.) 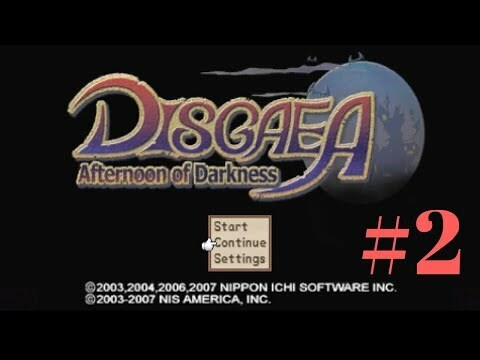 for Disgaea - Afternoon of Darkness (USA) to Emuparadise. Do it now!